The Lancia Stratos HF by Bertone is a car so ahead of its time that it almost seems like a Syd Mead illustration that came to life and launched itself off the page – right into the World Rally Championship. The Stratos was powered by a 192bhp, 2418 cc DOHC Dino V6 engine with triple Weber carburettors, a 5-speed manual transmission, 4-wheel independent suspension with front coil springs and rear MacPherson struts, and 4-wheel ventilated disc brakes. The wrap-around windscreen offered an astonishingly wide field of view for both the driver and co-driver – an important feature for a car that was destined to spend most of its life going sideways at 80+mph. The “HF” in the name stood for “High Fidelity” and the “Stradale” means that this is the street-legal version of the Stratos – it came with a slightly detuned engine but was still capable of running the 0-60 in under 5 seconds and hitting a top speed in the 150mph range. This particular Stratos is thought to be one of the most original non-museum examples left anywhere in the world, its odometer reads just 3,236 kilometres and it’s never been restored or even resprayed – this car looks identical to how it did when it rolled out out of the Bertone factory in 1974. 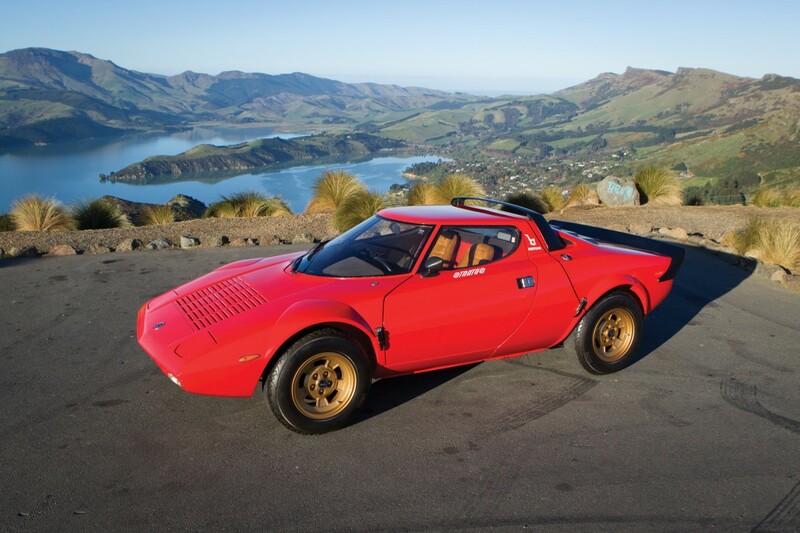 The Stratos HF would go onto win the World Rally Championship in 1974, 1975 and 1976 – further cementing its place in the record books and ensuring it would never be thought of as just another pretty face. The car you see here is due to roll across the auction block with RM Auctions at Monterey on the 15th of August 2014, its estimated value is in the $450,000 to $650,000 USD range – meaning that I could probably sell my house, rob the local bank and start a meth lab, and still not quite be able to afford it.